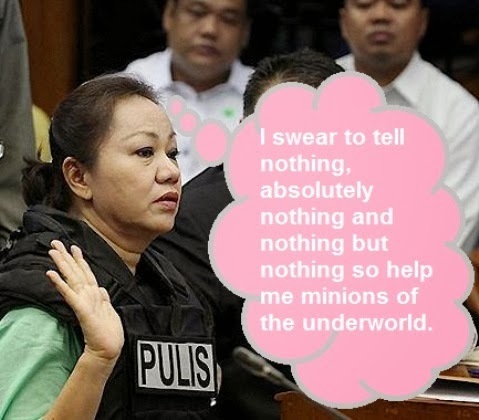 Janet Napoles should get a Guinness record for most evasive maneuvers in a senate hearing. No amount of prodding, imploring and veiled begging could cure Napoles' severely impaired memory in relation to the ten billion Pork Barrel scam. Reminds me of pop songs. Repeat four lines of lyrics for two minutes until fade, but imagine listening to the same four lines for six hours! And after all that, what did the senators gain? The hearing was not intended to establish the guilt or innocence of Napoles and others allegedly involved in the scam. It was supposed to have been conducted in aid of legislation so that the senators could craft better laws to prevent future similar scams. I can’t imagine now what kind of legislation they can form out of that session. 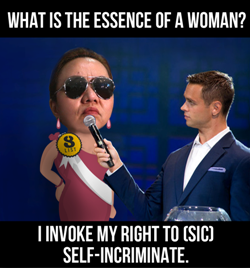 Maybe they can pass a law that will make the statement “I invoke my right” illegal in senate hearings if the invoker can’t pronounce self-in-cri-mi-na-tion along with it. Napoles making her cheat sheet before the senate hearing. But come on, we’d be kidding ourselves if we think the senators were thinking of legislative work when they questioned Napoles. You could see from the way some of them ground their teeth to dust in frustration that what they were after was a confession from her and for her to name names, but Napoles did not crack. Now that we’ve wasted six hours of our lives listening to Napoles’ ala pop song chorus reply, what are we to expect next? They say the senate might call Napoles or her husband back in for another round of questioning. My tip to Napoles: She should study and adopt Pinocchio’s method of evading questions which he demonstrated in the movie Shrek. Those who have tried his technique swear that it’s guaranteed to prevent noses from growing while lying. If I am going to hear the same 4-lined lyrics of the song over and over again, I might as well sleep which I am sure will be more beneficial than listening to her. I watched the hearing and it looks like she was lost. I'm sure someone is behind all her schemes. The memes made are just so funny. While watching the hearing, I saw Napoles smile many times. I don't know what she was thinking but probably she was kidding all along. She should be charged with perjury! Grr. It was such a waste of time and resources for the country. Did I get it right? She managed to be free of paying high legal fees and get the services of PAO in the process? it was already been anticipated that she will answer that way to the senate. it was just disappointing since it was exactly as expected. Yahweh bless. I think we all know that it will happened. So, what's new? I had fun reading this post. Of course watching Napoles saying nothing at all was not fun, but I love the way you break down and analyzed what had happened during the session.